The name of Ignacy Feliks Dobrzyński (1807-1867) is still not well known outside his native Poland, but there was a time when he vied for attention in Warsaw’s musical circles with a near-contemporary who went on to become the country’s most famous composer. Both Dobrzyński and Fryderyk Chopin (1810-1849) became students in 1826 of the foremost Polish composer of the time, Józef Elsner (1769-1854). Elsner realised that they were both exceptional. But while the career and reputation of Chopin went on to flourish after he left Poland (just before the November Uprising in 1830), Dobrzyński – who remained in Russian-occupied Warsaw – found that his compositional ambitions were thwarted by the difficulties of working in an increasingly provincial culture. The works on these CDs date from a time when Dobrzyński was a young man. A precocious pianist, he was only seventeen when, in 1824, he wrote his Piano Concerto, two years before beginning his studies with Elsner. He followed his First Symphony, of 1829, with a Second, in 1834, which was written for a competition in Vienna. Dobrzyński substituted a new slow movement much later, in 1862, and it is in this version that the Second Symphony has since been performed. Uniquely, both slow movements are included on these discs. Although Dobrzyński won an award in Vienna, the greater prize was the admiration of Felix Mendelssohn, who conducted the work in Leipzig in 1839. In the intervening years, Dobrzyński had completed what he regarded as his masterpiece, the opera Monbar, czyli Flibustierowie (Monbar, or The Filibusters). In 1845-47, Dobrzyński embarked on a large-scale tour of German cities, where his Second Symphony and excerpts from Monbar were performed, and this provided him with a welcome if temporary escape from his restricted creative life in Warsaw. In attempts to open up the musical life of the city, Dobrzyński became director of the opera at the Teatr Wielki (1852-55) and organised orchestral concerts. But, disillusioned with internal politics, in 1860 he withdrew from such public activities, and his last major work – incidental music for a staging of Adam Mickiewicz’s nationalist poem Konrad Wallenrod (1828), which had helped to inspire the 1830 Uprising – was left incomplete at his death. Despite its representing something of an early calling card for Dobrzyński, there is no record of a performance of the Piano Concerto during his lifetime, although almost certainly he showed it to Elsner and to Chopin. Its first known performance did not take place until 1986. The score was never published and its manuscript has presented some challenges to performers. This recording goes back to Dobrzyński’s initial version, edited by the Polish composer and musicologist Krzysztof Baculewski. His edition restores sections which Dobrzyński subsequently marked to be cut (mostly in the first movement), it reinstates occasional cuts in orchestration, and it reconstructs a few missing fragments. The cadenza in the finale is by Emilian Madey, the pianist in this recording. The Piano Concerto relates to the style brillant of composers such as Hummel and Field, with more than a passing nod to Weber and to late eighteenth-century idioms. After the orchestral exposition of the first movement, the soloist is almost always in the foreground, combining vivacity and an occasional youthful gaucheness with lyrical and decorative expressiveness. The passages marked dolce and cantabile are particularly notable, bringing an unusual warmth as well as the dynamism expected of an opening movement in sonata allegro form. The piano writing in the 9/8 second movement has a simplicity that harks back to some of Mozart’s slow movements. Its developing embellishment, however, belongs to Dobrzyński’s era. After a return of the opening theme, the music enters a short section in which a rhythmic string ostinato accompanies a recitative-like declamation by the soloist. Whether Chopin had this passage in mind when he composed the central section of the slow movement of his Piano Concerto in F minor (written five years later, when he was still only nineteen) is a matter of speculation. Chopin created a more developed drama out of the device, but Dobrzyński’s version is still striking in context. The finale is a jaunty and discursive Rondo, replete with pianistic twists and turns, as well as unexpected combinations of three- and four-bar phrases. It is cast as a krakowiak, a fast 2/4 folk dance. Once again, connections may be made with Chopin: his Rondo à la Krakowiak (1828) occupies a similar world, even if Dobrzyński’s evocation of this rhythmically lively dance is more delicate and Chopin’s fiercer. After the central cadenza, Dobrzyński springs a surprise, in the shape of a totally new idea, the striding character of which is neatly integrated with the main theme in the recapitulation. The coda is short and headlong. Until the 1870s, the nineteenth-century Polish symphony was notable for its general absence. There were next-to-no opportunities for performances as there were no established symphony orchestras; the focus instead was on domestic music making, choral music, and opera. Elsner did write eight symphonies, though five of them date from the end of the eighteenth century. Dobrzyński’s two symphonies are therefore unusual in the Polish context. Unlike the Piano Concerto, the Second Symphony has managed to sustain a tenuous place in the repertoire, even if until the 1950s it was usually performed incomplete. It was published towards the end of Dobrzyński’s life, in an arrangement for piano duet. Initially, given its success in Vienna, the work was known as the ‘Competition’ Symphony. Soon, however, it acquired a more inspiring title, Characteristic Symphony in the spirit of Polish music. As Dobrzyński composed it in the aftermath of the 1830 Uprising, its character was all-important. Consequently, each movement is linked to a Polish dance – a polonaise, a kujawiak, a minuet / mazurka, and a krakowiak – and this itself is unusual within the wider European context of the genre. 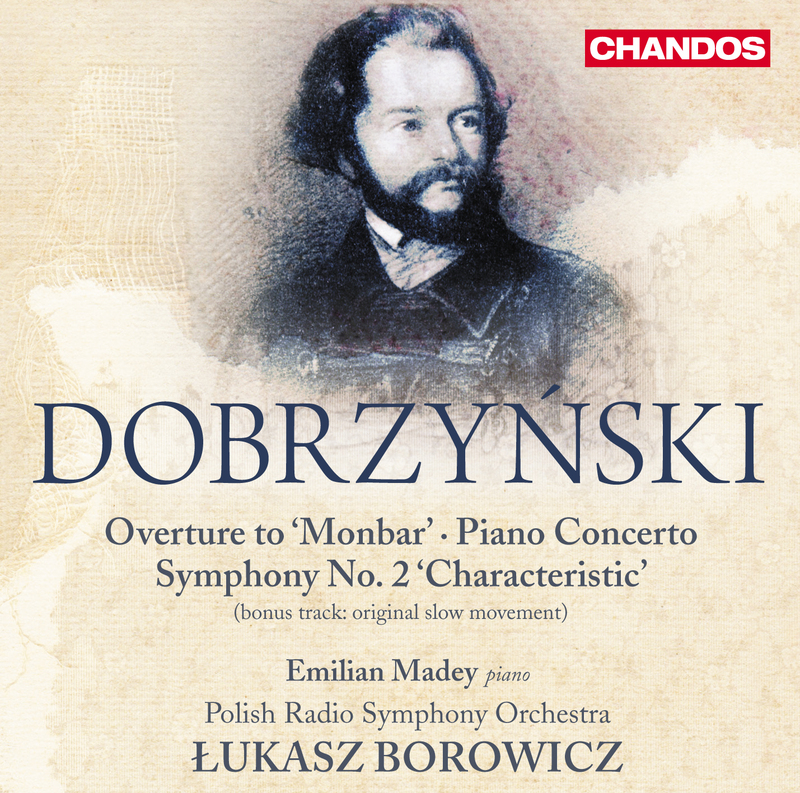 The ten years since the Piano Concerto had wrought dramatic changes in Dobrzyński’s compositional voice. Now the music is urgent and impassioned, no doubt a reflection of the 1830s in occupied and divided Poland. The key of C minor is one declaration of intent, the forceful orchestration another. The sombre introduction, including woodwind phrases that seem to have sprung straight from the operatic stage, presents the movement’s principal theme, which then opens the ensuing Allegro vivace (a woodwind motif also reappears). This polonaise is turbulent rather than stately, fixated on the principal theme, which proceeds to spend much of its time in the relative major, E flat. The key shifts in the development are interrupted by a fugal passage, while the brief return to C minor in the recapitulation is thrust aside by a switch to C major. Even though the movement is predominantly in the major key, it seems to maintain a furrowed brow as it presses forward. A final shift back to C minor for the short coda underlines the idea of the Polish spirit undeterred by misfortune. Dobrzyński’s first – and discarded – slow movement was an Andante grazioso in 6/8. In complete contrast to the opening movement, there is little sense of angst despite turning to the minor key after the opening idea. The straightforward ternary design of the movement is characterised by a gentle pastoral mood, with its main theme conjuring up a distant horn call. The scoring brings out not only the horns but also the woodwind, the strings keeping in the background, often with pizzicato figuration. Dobrzyński’s second slow movement is quite different. It was not newly composed but borrowed from the String Sextet, Op. 39 of 1841. Dobrzyński retained the original title, ‘Elegia’, but changed the marking Andante espressivo e sostenuto to Andante doloroso ma non troppo lento. The most noticeable development between 1834 and 1841 manifested itself in his musical language. His idiom had become more chromatic and the introductory theme in cellos and bassoons anticipates a Wagnerian turn of phrase. The main theme of this kujawiak (a slow cousin of the mazurka) is announced by the trumpet, accompanied by trombones and timpani. Dobrzyński sustains the reflective mood, even through the decorative violin writing brought across from the sextet. By the return of the main theme, the kujawiak has been transformed into something more robust and proud, without totally losing its melancholy edge. The Minuetto alla Mazovienna is a rhythmically witty amalgam of the minuet and mazurka, complete with second-beat accents and unexpected, dance-related pauses. The Trio features a folk-based call-and-response between woodwind and solo violin, usually doubled by the violas. The mood since the symphony’s opening has now eased considerably. An exhilarating rondo completes the journey from darkness to light. This krakowiak – when compared to its counterpart in the Piano Concerto – is clearly more in the romantic mould. Its theme is taken from a popular song, Albośmy to jacy tacy (That’s just how we are), from the Kraków region. Perhaps here Dobrzyński is doffing the cap back to Chopin, who had alluded to this melody in his Krakowiak just six years earlier. Dobrzyński quotes the tune directly, although he presents the melody initially in the minor rather than the folk tune’s original major. Once C major is reached, the movement races to its conclusion, forming one of the most successful examples of a folk dance reworked in symphonic terms. Luck was often not on the side of Dobrzyński when it came to performances of his music. There were frequent delays and he died without hearing some of his major works. His opera Monbar, czyli Flibustierowie (originally titled ‘The Corsair’), composed 1836-38, had to wait twenty-five years for its complete premiere under his baton in Warsaw in January 1863. Even then there were only three performances before the break-out, two weeks later, of yet another protest against the occupying forces, the so-called January Uprising. Monbar was shelved once more and not heard again until given a concert performance in Warsaw in 2010. The one number which survived in the repertoire was the Overture, which had been performed separately as early as 1837. As elsewhere in Dobrzyński’s output, the influence of Weber and Italian opera looms large. Nevertheless, a Polish critic wrote in 1862: ‘the distinctive themes, the fire, and the truly sparkling orchestration make it the most striking of the orchestral works heard among us’. The background for Monbar is exotic: the activities of international privateers operating in the Caribbean around Haiti. Monbar is the chief pirate, and the plot involves familiar operatic tropes of storms, fighting, love, and treachery. The Overture initially belies such adventures, beginning with a delicate solo for bass clarinet, an uncommon spotlight for the instrument in the late 1830s. (There remains the possibility that Dobrzyński revised parts of his opera during the twenty- five years before its premiere, so we may never know whether this stroke of imaginative orchestration was ahead of the game.) The solo gives way to a lyrical exchange between horn and woodwind before the main Allegro agitato gets underway. The woodwind carry much of the melodic interest here, too, especially in the cantabile second subject. There is, however, plenty of orchestral swashbuckling. After a brief development, the bass clarinet solo reappears, leading to a return of the second subject and a suitably extrovert close.